Neverland. 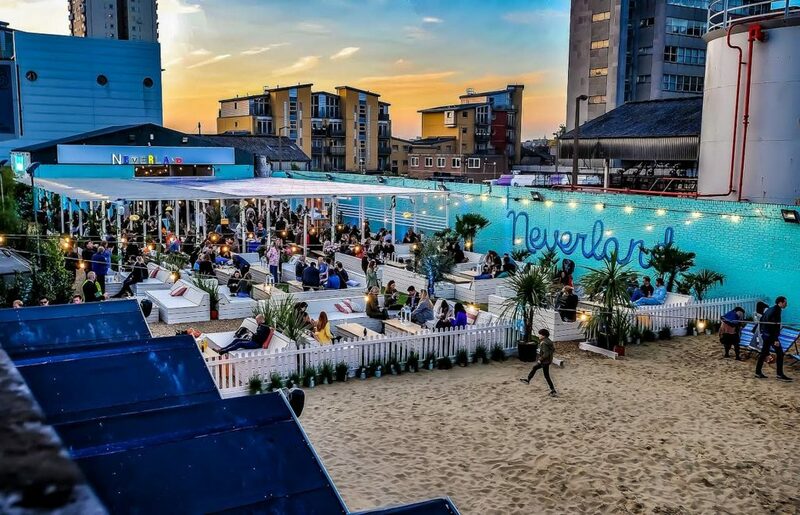 Fulham’s first Thamesside urban beach spot has opened as a BYOB alfresco dining and street food experience. Decked out with a 65ft white-sand beach, palm trees, swings, grassy areas, deck chairs, music all along the river, you’ll get a taste of the sea breeze without leaving Zone 2. As an unlicensed venue, it means you get to bring your own booze. That’s not to say you will not be able to enjoy your favourite Summer tipple. Create your own cocktails from the ‘Unleaded Bar’ where mixologists will create a bespoke Summer tipple or pimp out your prosecco with peach, passionfruit or raspberry. Groups can hire out beach huts or day party beds with the option of having a personal Beach Butler to fulfil all your beverage needs. Street food offerings include potatoes drowning in raclette cheese from Le Rac Shack, Taiwanese Baos from Le Bao or a light serving of traditional rice paper rolls from Sin Chow. To satisfy your sweet tooth, churros and ice cream are also available. Worried about the weather? Don’t. Between a Pergola and the beach huts, Neverland has 300 covered seats, meaning you won’t be left outside in the rain. Whether it’s a romantic alfresco drunk for two or a weekend catch up with friends, Neverland has it all. Address: Neverland London, Wandsworth Bridge Road, London. SW6 2TY.